What is PADI Master Scuba Diver? PADI Master Scuba Diver rating, is the highest non professional level in the PADI System of diver education. It means that youve acquired significant training and experience in a variety of dive environments. Be certified as a PADI Advanced Open Water Diver (or qualifying certification from another training organization). Be certified as a PADI Rescue Diver or Junior Rescue Diver (or qualifying certification from another training organization). Have logged a minimum of 50 open water dives . Want it. Live it. Dive it. Master Scuba Diver. This rating puts you in a class of distinction. You earn it by diving it, writing your ticket to endless adventure through the experience and training that set you apart as a PADI Master Scuba Diver. 5 days atleast. or can be done on week end basis. 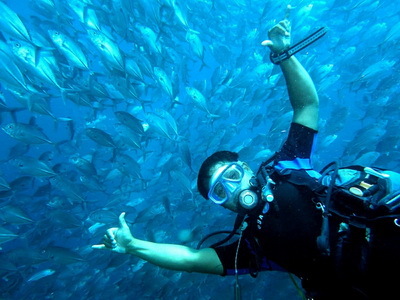 Continue to Padi Divemaster course and become one of the Padi Professional.